Jack Marriott scores the second Posh goal at Bradford City. Photo: Joe Dent/theposh.com. Manager Grant McCann hailed an outstanding all-round performance as Peterborough United barged into the League One play-off places with a 3-1 Boxing Day win at rivals Bradford City. Two goals from top scorer Jack Marriott and another from in-form Danny Lloyd secured three points and sixth place in the division ahead of Saturday’s game at struggling MK Dons (December 30). Posh manager Grant McCann watches on at Bradford City. Photo: Joe Dent/theposh.com. Posh led 2-0 at the break and survived a second-half siege thanks to a rock-solid defensive effort. City’s only reply was a stunning strike from distance from former Posh forward Paul Taylor. “We were outstanding,” McCann stated. “We played great in the first half to establish a 2-0 lead and then we showed a different side to our game after the break when they threw everything at us. “We defended the penalty are so well. They sent many crosses into our area, but I was never worried by them. My back four dealt with the pressure superbly. “I was disappointed they didn’t get their clean sheet, but it took a quality goal to beat them. Posh striker Jack Marriott is beaten in the air by Romain Vincelot. Photo: Joe Dent/theposh.com. “Our own quality was spot on. We used the front three really well. We knew their full-backs pushed up high so we wanted to take advantage of that by keeping our forwards up top. 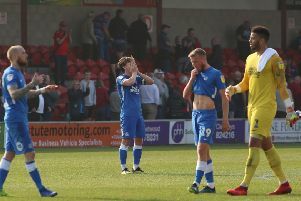 Maddison and Marriott seem certain to attract interest from higher ranked clubs as soon as the January transfer window opens, but Posh chairman Darragh MacAnthony insisted on Twitter after this third League One win in a row that he wouldn’t sell either of them for £5 million. “We’re Peterborough United,” McCann stated. “Sometimes we lose our best players to bigger clubs and if Jack went we would pat him on the back and say ‘well done’.